Mechtild Runde-Witjes was born in Münster, Germany, in 1965. A studied garment engineer, she graduated from extra occupational art studies in the master class of Andreas Durrer (Assenza-Malschule). She lives and works in Kerken in the Lower Rhine. Since 2003 she has run her own studio. 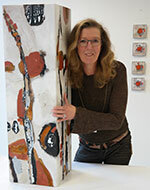 Her work is represented by Sandra Hofer in all of Germany. Mechtild Runde-Witjes sees herself as an abstract artist that has the intention of expressing feelings through the forms and surfaces included in her artwork.